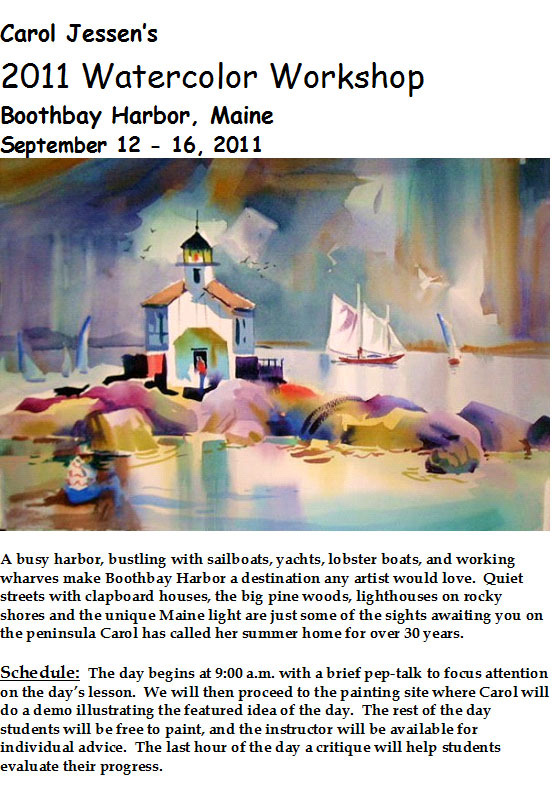 We’re six months out from the workshop in Boothbay Harbor, Maine September, 2011. Reserve your space soon to be assured that you won’t be left out! ( See attached brochure). Now is also the best time to reserve your room at the Beach Cove Resort or other lodgings in the area. I am pleased to announce that Gleason Fine Art in Boothbay Harbor will be giving me a show during the whole month of July. Since Gleason’s is one of the most well-respected galleries in a state known for its fine galleries, I am very happy to be represented by Dennis and Marti Gleason. One last note: I will also be teaching two classes for beginners and intermediate watercolor students in Damariscotta, Maine this coming summer at the River Arts Center. There will also be a one day workshop in August. Contact the Center for more information on dates and tuition. I hope you can join me for my workshop in September or for one of the classes in Damariscotta this summer. Chase away the winter blahs, and sign up soon!